The sock pattern I’ve had in the works for a little while now is finally just about ready to go out into the world. 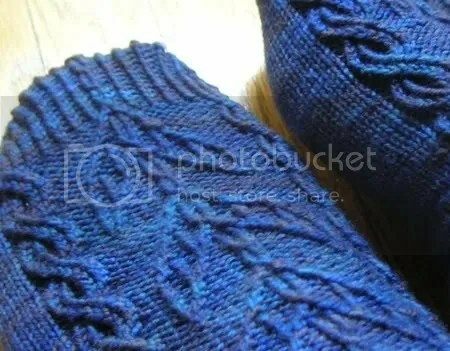 If you’ve been by my Ravelry projects page lately, you know what that’s about, but if you haven’t, here’s a quick taste. My pattern testers, bless them, have alternately called this “frakking hard” and “cracktastically awesome”. I think that pretty much sums up what I was going for. Full reveal soon. ::tents fingers:: Sooooon…. Ooo, looks great! Can’t wait! It looks hard but gorgeous! Very pretty – I like the design: it flows. Oooh! Me likey! My next pair of socks was going to be Eunny Jang’s Bayerisch, but maybe it’ll be these instead! I like the way you’ve kept the spiral, but added the geometric pattern – very cool! But the results are all worth it, and look at those beauties! I have to queue that pattern when it appears! Wow – that’s fabulous. Now when? I’m going on vacation on Saturday and need some more projects to take (who am I kidding, I’ve filled the Airstream with yarn before food). Oooh, I like the look (and sound) of that! Can’t wait! Wow. I can’t wait to see them! I keep seeing people fav’ing and commenting on this on Ravelry — and super surprised that I hadn’t seen it here yet. BUT, from what I’ve seen from Ravelry has made me super excited for the pattern to come out and to see other people’s variations! It looks so cool! I might even tackle sock two before the weekend. Be-yoo-ti-ful socks! What is that gorgeous yarn? Are they toe up or cuff down?